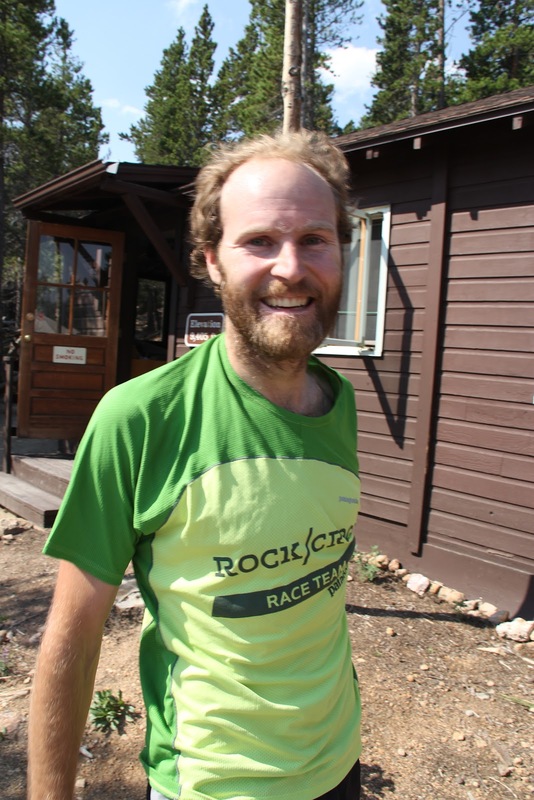 Update: Andy broke the Grand Teton round trip record yesterday (8/22). Here's his interview about that record. Ah, 6:30 am on a Wednesday morning, my last day off and I am awake before my 2 year old son. Not only did he sleep all night, but the neighbors also took a night off from the 2am disco parties they have been having all summer. A good night sleep was had by all. "Daddy! Huck's awake! Ready to get up! Want to eat strawberry yogurt!" comes piping in from the room next door in an oh-so-cute but oh-so-demanding high pitched voice. Well, at least I had a solid 30 seconds of time to enjoy the quiet morning. "Do you want to run first or do you mind if I go?" I roll over and ask my wife. This question usually follows Huck's morning greetings, since my wife and I both love to run. "You can go ahead" she replies. Andy, just after his Long's run. I hop out of bed and grab Huck who is all smiles and laughter this morning. I notice that my legs are feeling pretty darn spry after taking a day off from running yesterday. Legs feel good, I slept all night, hmm, maybe I should go for a longer faster run today. "Reb, would you mind if I tried to run up Longs Peak this morning?" "Sounds great, as long as you run fast and can be home to watch Huck before my 10:30 meeting," comes her response mingled with peals of 2yr old laughs from the bedroom. Sweet. I have been meaning to run Longs again all summer. Last summer I was lucky enough to break the round trip record with a time of just over 2 hours. When I got back down, I found out that I had missed the ascent record by 1 second. That fact had been nagging me ever since. Enough time had also elapsed since then for me to imagine I might be able to go faster. 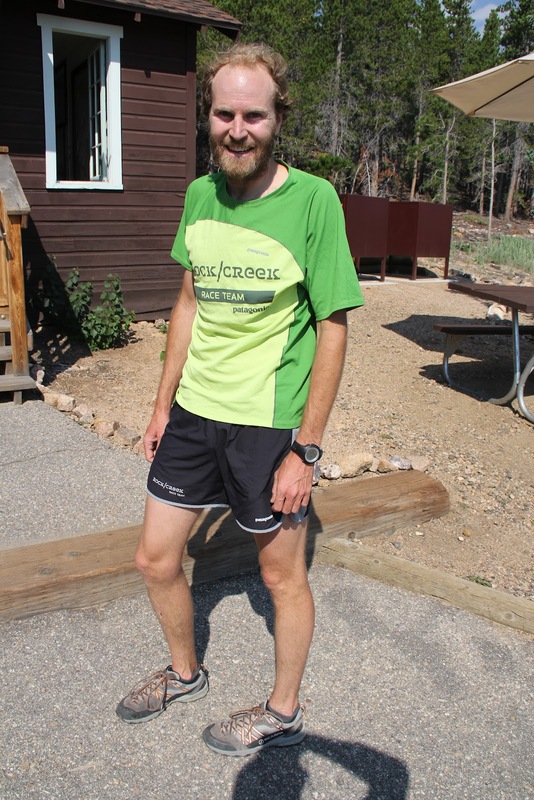 On top of those two facts, I had been seeing more runners on the mountain this summer, including the likes of Anton Krupika (aka Adonis). I figured I should give it another go before these younger, stronger, faster, and definitely more handsome guys pushed this old, balding, scrawny guy back into oblivion. I eat some breakfast: cereal, hot chocolate, caffinated GU dissolved in water, crank some Shakira on the stereo, and get dressed. Its 7:30 now which gives me 3 hours to get up there and back. This includes at least 40 minutes for driving time. That leaves 2 hours and 20 minutes to warmup and run the Peak. "I love you guys, I will see you in a couple hours!" I say as I head out the door. "Daddy! Want to give you a hug!" Who could ever refuse such a request? 7:35 now and I am out the door for take 2. On the way to the trailhead, I matched my driving style to the classic and thoughtful soundtrack of "Push the Tempo" by Fat Boy Slim on repeat at full volume. The song only has three words, "push the tempo," sung to a raging techno beat for several minutes. Its a good one to get stuck in your head. The message is pretty clear. By the time I get the trailhead, my heart is racing, adrenaline coursing through my viens, and I am ready to go. Screeeeeech. No parking except for one small parallel spot. Nothing like some New York style 10,000 point parallel parking to get get me pysched up. Oh well, more time to fully memorize my three word techno song and to drink the rest of my caffeinated GU water. I warmed up in a futile attempt to avoid burning legs and lungs in the first five minutes of my ascent and started up the 5000 ft ascent. After about 30 seconds my lungs started to burn and a few seconds later my legs followed suit, so much for the warm up. Lucky for me, my techno brainwashing worked and only three words race through my head: "push the tempo, push the tempo, push the tempo...."
The route I chose goes straight up the mountain for about 5.5 miles using a series of old trails below treeline and talus fields above treeline. It culminates in about 200 ft of 5.4 climbing right on the edge of the Diamond followed a section of 3rd class terrain to the summit. Needless to say it is pretty darn steep the whole way up. In my mind I pretend that the short less-steep sections along the way offer some recovery. The first steep push lasts about 10 minutes then the route levels off some. My legs have stopped protesting and resigned themselves to the fact that yet again my brain is making them do something silly. My breathing has evened out as well, so I follow the advice in my head and push the tempo. If I can pretend that this part of the route is "flat," then I might as well pretend I can recover while running faster. I hit the next steep section which takes me up to treeline. My legs and lungs again try to talk me out of this run, but luckily my brain isn't listening. The wind picks up above treeline as it always does on Longs. I keep running up, up, up trying my best to bound up the scree and float across the tundra. After just over 1 hour of running, I am at Chasm View where the Diamond and the North Face intersect. The winds die down a bit here so I've got that going for me, which is nice. This point marks the start of the 5.4 climbing. My pace is right on, and I should make it to the top in less than 15 minutes. Running water left over from last night's rain still covers sections of the climb. Here's the section of climbing on the North Face of Long's that Andy is referring to. I move efficiently up the pitch, taking care to make sure that I stay secure and safe during this short section of climbing. This pace allows me to catch my breath and recover for a couple of minutes before the final push to the summit. At the top of the 5.4 section I take off again. 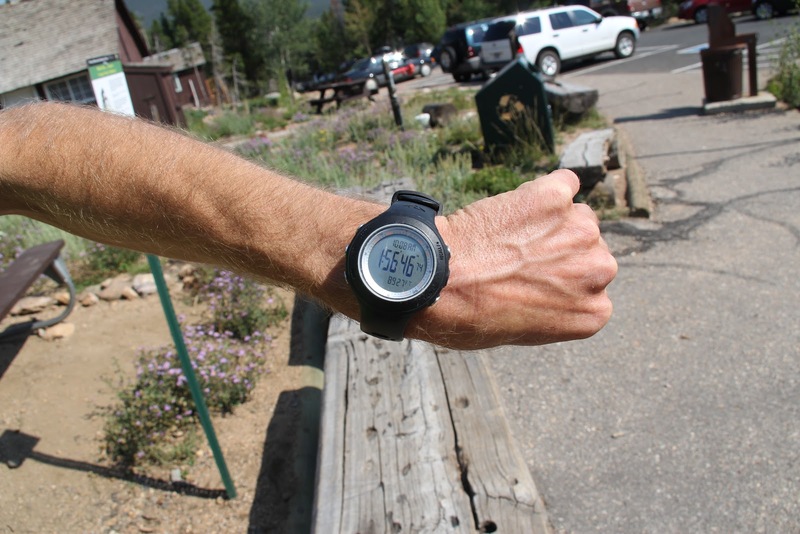 Huffing and puffing I "sprint" at a pace that most runners would consider a slow jog up the final third class section to the summit, tag the summit boulder, look at my watch (1:14:08 YES! ), and before most folks on top realize I am there I spin around and start running pell mell back down to the wet 5.4 dihedral. I slow down for the downclimb. This part takes me longer than going up the pitch, but I really don't want to screw it up. Once I hit the base of the climbing, I am running again dodging boulders and aiming for loose scree that will help me slide down the mountain. Running across the tundra and talus back down toward treeline I managed to fall twice. Fortunately this technique may have actually made me move faster as I rolled down the hill. Its too bad I couldn't figure out how to roll all the way down the mountain. I made it back below treeline with plenty of time to spare. I might actually break 2 hours on this trip. I hit the one section of the main trail that I use on this route and let loose. Yahoo, I am going to make it. What could possible go wrong now! Whoa, roll, tumble, ouch, doh. Arghhh. I am only about five minutes from the trailhead and I just rolled my ankle. Lucky for me adrenaline works better than ibuprofen. After a few seconds of pain, I am back on my feet and running down the hill albeit with a bit more awkward stride. I hit the last steep part of the run and sprint down towards the trailhead. Past the old power line trail, across the creek, and down the last hundred yards to the Ranger Station. Stop the watch: 1:56:46. I catch my breath and show the folks at the station. They take some photos and write the times down. I head for the car. Its just after 10am and I need to get back for my day with Huck. As I turn the car on, my eardrums almost explode. Ack, what loud obnoxious music is this? There's only three words in this song! Andy, modeling his SICK Rock/Creek gear. i keep typing and erasing comments... next to your unique combination of sheer determination and rousing good humour everything i put is flat. bottom line? this is very cool - thanks for sharing. Andy you are the toughest, most lovable geek that I know! Way to run! And thanks for taking us along! Wow, passionate write up, I could feel the excitement! Loved it! I stood on top of Long's in 2005 after taking the non-technical Keyhole route--took me three hours to go up, another two to get back down. I love Andy's humble and funny tale of his amazing climb which culminated in going home to take care of a two-year-old. No rest for the weary record-holder! Way to go Andy! Amazing. Loved reading the report in my email, but then I clicked on the Logic site and now am terrified as the picture of the climb showed up. CRAZY, CRAZY SCARY!!!!! Glad you broke the record and nothing else! Thanks for the time to record and report! Awesome, inspiring run Andy! I doubt I'll be able to fit in a rested FKT-style effort on th Longs RT before summer is out, but I was already super-impressed with the previous 1:18 ascent record and your chopping another 4min off just makes it that much more stout! Awesome that you were able to find a couple more minutes on the descent, too...you should really consider entering the PPM next year if the timing works for you. Congrats on Long's and the Grand! Impressive work! Nice work on the Grand too. It was fun to hollar encouragement from three pitches up on Corkscrew! Lighthearted, comical, inspiring, brilliant! Encore please! Well done (both the FKT and the write-up)! When do we get the Grand write-up?